It seems that just about every serious deer hunter with his own patch of property to hunt is hooked on food plots. Food plots are great. They supplement a whitetail’s dietary needs and can provide their primary source of food in heavily forested lands and after crops are harvested in agricultural areas. Food plots benefit all deer. But if you want to attract bucks, especially big bucks, mineral licks may be the way to go. Of course, does will use mineral licks too. But if you’re looking for a sure fire way to get bucks on your property, start a mineral lick. Can You Use Licks Anywhere? It is important to point out that hunting over a mineral lick is a no-no in some states. In others it is illegal to start a mineral lick at any time. So before pouring mineral check your state game regulations. It’s a pretty good guess that the first hunters to discover the magic of minerals were those hunting near cattle. Farmers often put out salt blocks for cattle to lick. Deer, being the adaptable creatures they are, would often steal a lick or two from these salt blocks. A lot of hunters still use salt or mineral blocks but many are seeing the advantages of granulated minerals. Many of these formulas are designed specifically for deer and offer more than just salt. You’ll find calcium, iron, potassium, magnesium, phosphorus, vitamins, and more in many supplements. There is a wide variety of mineral supplements on the market including Antler King, Monster Raxx, and Whitetail Institute. Some hunters pour minerals right on the ground. This way the mineral seeps into the ground and after the bulk of the granules are gone, deer will eat the soil to get the mineral. 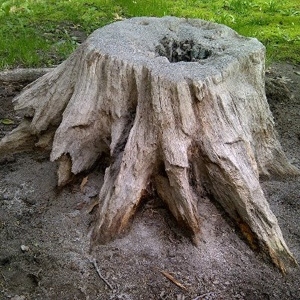 One of the most effective ways to deliver mineral is to pour it onto a dead tree stump. You don’t lose as much and you’ll still get the same effect after the mineral appears to be gone. Deer will chew the stump to get the absorbed minerals. Where should you put your licks? Find a stump near a trail and adjacent to some thick brush. If you put the lick in a hidden area, it may take a while for deer to find it. What you want to do is put the mineral site near a heavily used trail so cruising bucks will find it and begin utilizing the minerals. Another important element is cover. A buck won’t use a site that is out in the open during the day, if at all. If the site is near some thick cover, a neighboring buck just may decide to start using your property as his home territory. If you are providing everything he needs to survive and thrive and a neighboring property is lacking some of the essentials, you’re in business. If mineral sites are legal in your state, they can be started at any time. But the best time to start pouring mineral is in February or March. Bucks will start craving minerals to begin building a fresh set of antlers. If there is a trail camera over the mineral site, you’ll start seeing a major upswing in activity in April. By the way, mineral sites are great places for trail cameras! The goal of the mineral site is to get bucks to feel comfortable on your property. If he’s more at ease, he’ll be easier to kill when the season opens.